Photograph of the Shiva temple at Barauli in Rajasthan, taken by an unknown photographer for the Archaeological Survey of India Collections: Northern Circle (North-Western Provinces and Oudh) in 1896-97. Baroli is one of Rajasthan's oldest temple complexes and is located about 56 km south-west of Kotah. The Shiva temple at Baroli is near the western bank of the Chambal River and was erected in the first half of the 8th century A.D. 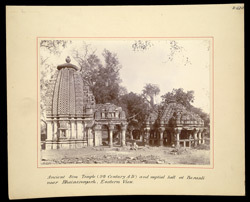 The temple had been previously described by James Fergusson in his 'History of Indian and Eastern Architecture' in 1891, "...one of the oldest, and certainly one of the most perfect, in Central India, is the now desecrated temple at Barrolli, situated in a wild and romantic spot...The principal temple may be ascribed to the 8th or 9th century...Its general outline is identical with that of contemporary Orissan temples. But instead of the astylar enclosed porch, or mantapa, it has a pillared portico of great elegance, whose roof reaches half-way up the temple, and is sculptured with a richness and a complexity of design almost unrivalled...the temple is barely 60 ft. high, so that its merit consists entirely in its shape and proportions, and in the elegance and profusion of ornaments that covers it."